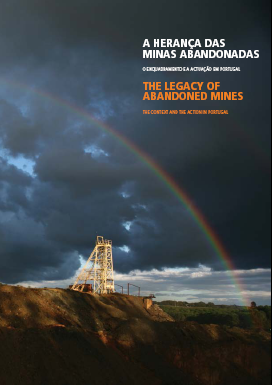 “The Legacy of the Abandoned Mines – The Context and the Action in Portugal”, an EDM initiative in partnership with DGEG, intends celebrating ten years of work developed within the scope of the concession contract concluded with the Portuguese State, dependant upon the legal regime of the concession of the activity of environmental recovery of the degraded mining areas, approved in Decree Law No. 198-A/2001, 6/7/2001. This document, initiated by the former Board of Directors headed by Dr. Delfim de Carvalho, was, meanwhile, under the guidance of the current chairman, Dr. Rui Rodrigues, adapted and complemented jointly with Eng. Carlos Caxaria, DGEG Deputy Director General, considering the opportunity and objectives on which its dissemination was based, and comprises contributions from Dr. David Richard and Dr. Caroline Digby of the Post-Mining Alliance, related with the “general view of Mining Heritage”, and of Eng. Alfredo Franco, focused on the “background of International and European environmental recovery”, to whom we formally render our formal acknowledgements. The chapter referring to the “Situation in Portugal”, prepared by Prof. Gaspar Nero, member of the Board of Directors who, from the very beginning, coordinated the activity of the concession, intends providing a view of the procedures followed by EXMIN/EDM, emphasizing instances of some of the results obtained in the many features considered in this activity. The planning and the paths that were followed, the technique placed on the solutions and their materialization, together with the funds made available for the purpose, allow estimating that Portugal, within a few years, will have dealt with one of the most relevant environmental issues existing in its territory – that of the mining legacy, thus becoming one of the European countries that is showing greater advance in this area. Note: In case of trouble viewing this book, please download it here.